merchantnavyofficers.com. Fair use may apply. 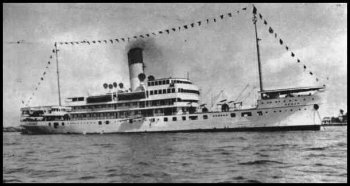 The Kedah was built for the Straits Steamship Company (Blue Funnel Line) in 1927 and operated on the Singapore-Penang express route for the next twelve years. "The little queen of Malacca Straits" was requisitioned by the Royal Navy in December 1939, given some rudimentary antisubmarine armament, and officially redesignated "Armed Auxiliary Patrol Vessel No. FY035." She patrolled north Borneo from 1940-1941 and was one of the last ships out of Singapore when the fortress fell. Near misses from bombs damaged her machinery, she lost power altogether halfway to Ceylon, and she had to be towed to Colombo by Dragon. Thereafter she patrolled the Bay of Bengal.